In my last review, I reviewed The Fall and Rise of Captain Atom issue 1. This continues that series as I review issue number 2. If you’re reading this, you more than likely read the first review. Still, a recap is needed. This story takes place after Captain Atom’s New 52 run. He exiled himself to moon because of his disconnect with humanity. Eventually, he came back, but something started to happen to his body. Dr. Megala is one of Atom’s friends and helps him during his journey. Megala noticed that Atom is having something he calls quantum flare ups. In his own weird way, Captain Atom is sick. His atoms are constantly forming and splitting. It’s one of the reasons he’s one of the most powerful beings in the DC Universe. However, this causes him to be unstable at times and appear to be unstable to the public. There were a couple of incidents in his New 52 run that happened, but no one was fatally injured. The first issue of this six part series though, saw his quantum flare ups destroy a section of a small town in Kansas. Even with the help of Superman, Green Lantern, and Cyborg, some people were injured and the total damage done is unknown. Captain Atom had enough, so he decided to go out on his own terms. He overloaded himself with his own quantum energy in an attempt to commit suicide. His plan worked…sort of. Instead of killing him, he was transformed back to his normal self and transported to the year 1994. In the second volume of his New 52 run, there’s an epic story where he has to travel through time to save the world. This isn’t a newfound power. I mentioned at the end of my review for the first issue, that I wanted to see this character win. Too many times, he’s suffered loss after loss. Too many times, he’s had to make sacrifices that no human has the selflessness to do. It’s why he’s my favorite, but I wasn’t in a mood to see him get drug through the mud constantly. Writer Cary Bates fooled me for 99% of this issue. By the end, I felt more heartbreak for Captain Atom than I ever have before. I get tired of artists changing so often during comic book runs. I know that things happen and this is a business, but sometimes, my eyes can’t take it. Thankfully, this isn’t a problem with this series. 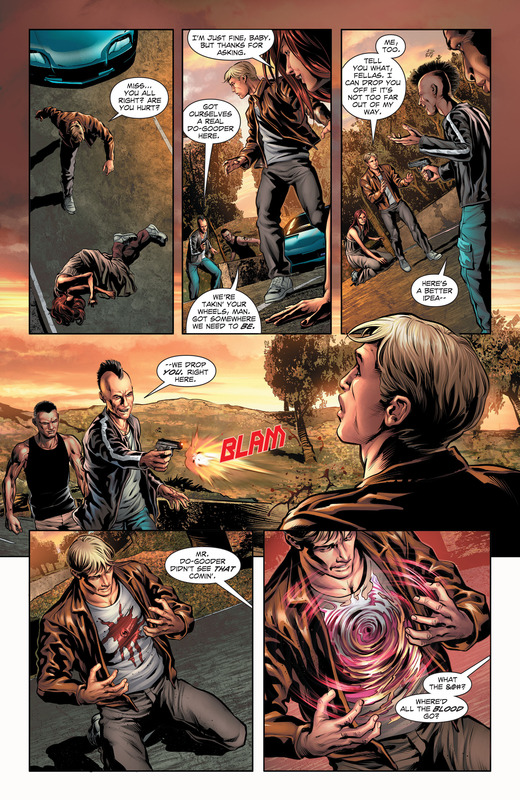 Will Conrad and Ivan Nunes are back as the artist and colorist. The opening page of this issue is beautiful. It starts off with Nathaniel narrating. He’s downtown celebrating the new year. The year is 1997. One thing I enjoy about Captain Atom that some may overlook is the fact he’s no dummy. No, he’s not a genius scientist, but he set out to understand his powers when he got them. There are times where Doctor Megala is saying something that sounds like Mandarin to him, but overall, he’s an intelligent hero. I never get tired of reading his thoughts. He attempts to stop a mugging in an alley. As he’s doing this, the narration continues about how different this year is from the future he came from. No 9/11, no Katrina, no Uber, YouTube, Facebook, nothing. He’s getting the crap kicked out of him too when he realizes the last thing that isn’t in 1997. Superheroes. The muggers leave him there for dead and two cops show up. He’s taken to a hospital. While on the operating table, Nathaniel notices how attractive one of the doctors is. He sees that her name is “T. Sato.” They have a moment where he tries to flirt with her, and she doesn’t turn her down. She tells him her name is Takara Sato. Just want to pause here for a minute and point out the importance of this relationship and his past one. 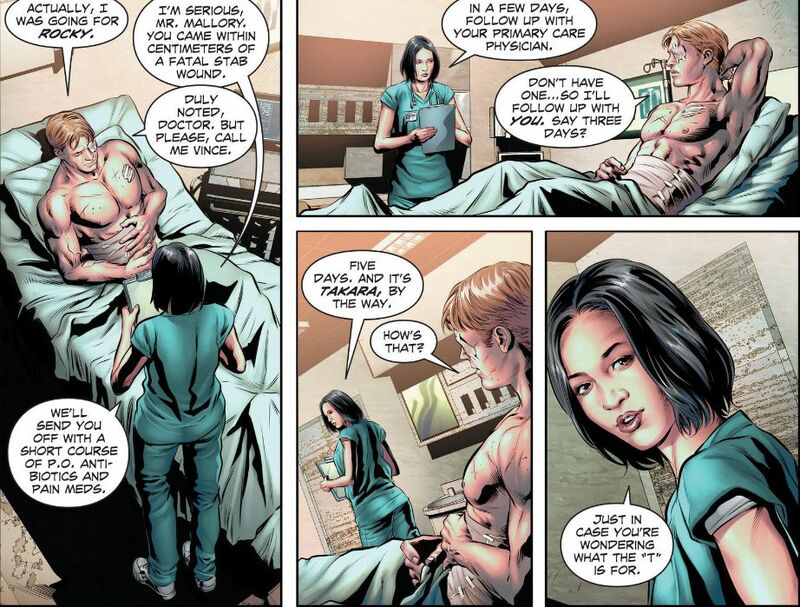 Captain Atom’s last love interest was with one of the assistants at the Continuum. Her name was Ranita and she was black. This current love interest is clearly Asian, probably Japanese. There needs to be more interracial couples in comics. I have ZERO problem with couples who are the same race, but this whole concept of race, and empowering your own race, truly doesn’t matter. Due to the racist history of countries like America, we’re forced to confront social injustices in our society, but we’re all human. It doesn’t matter. Nathaniel Adam may not have had this worldly view of women before his accident. Maybe he only dated blondes. As Captain Atom though, he yearned for love and affection. He didn’t give a damn where it came from. He valued the true beauty of the female smile and intuition. Some of us think like this already, I believe we’re born like this, but like said, our society was founded on judging women (and people) because they look different. This is a powerful message in his character, something that isn’t in most superheroes. Sure, I’d like to think Captain America would support noble causes like Black Lives Matter, but honestly, I could see him aligning with police on the issue of police brutality in America (especially Ultimate Steve Rogers.) But Captain Atom is a different kind of hero since his humanity was stolen from him. To say he truly understands and loves people, and women, would be a gross understatement. It isn’t something that is even brought up during this series, but I think it’s noteworthy since this is his second minority love interest. The issue takes an expositional turn next. The exposition in the next couple of scenes isn’t bad at all though. 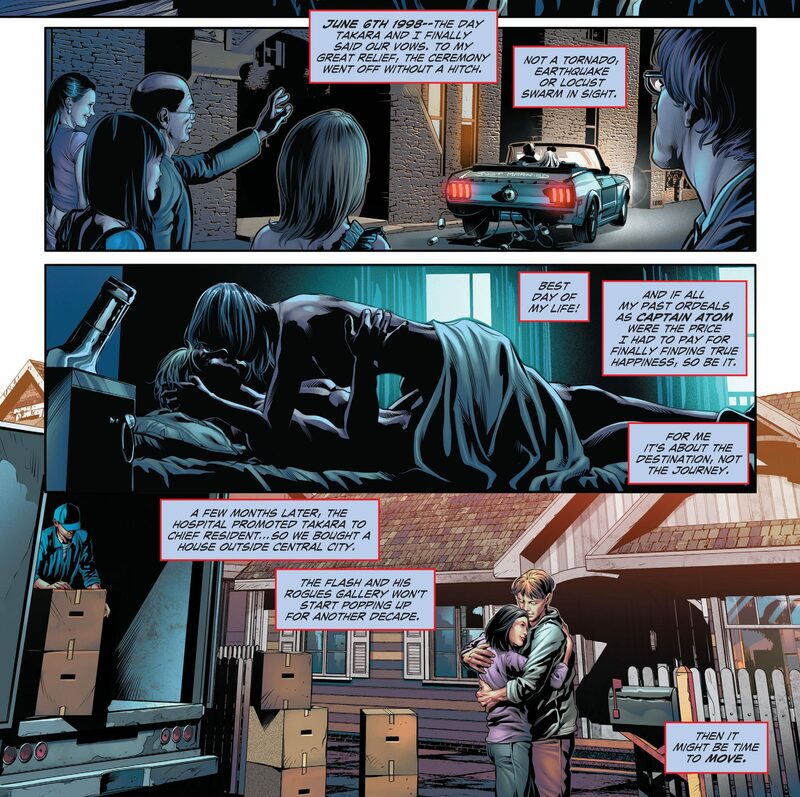 In the last issue, the expositional dialogue felt forced. This time though, it fits the story better. Nathaniel meets up with a science professor to discuss a “novel” he’s writing. Nathaniel is writing a novel on his life and the future in which he came from. The professor asks Nathaniel how the time traveler in the story managed to get money after being dumped naked in the middle of 1994. We learn that he acquired money by betting on football games. He never won enough to gain attention, just enough to make a new life for himself. The main reason Nathaniel came to this professor though is to get answers about altering the past. Naturally, he’s worried about being back in the past. He asks the professor how he can keep his protagonist from changing the past. The professor tells him that the time stream is self-regulating, and that it will always correct any disturbance. He tells Nathaniel that as long as the character doesn’t disrupt history, he should be fine. That’s enough of a good answer for Nathaniel. He decides to take his life by storm and marry Takara. Of course, she says yes. Later on, while working as a rescue pilot, he saves the life of Perry White, who’s famous for running the Daily Planet in the future. He wasn’t sure if he had made history or changed it. The wedding happens and it is the best day of Nathaniel’s life. Finally, a win! If you aren’t happy for him, then you probably don’t have a soul. His life as Captain Atom was nothing but seclusion and heartbreak. It’s nice to see him enjoying life again. He and Takara move to Central City after she’s promoted. Life is good. The last part of this issue, like I mentioned earlier is the most heartbreaking moment in Captain Atom’s history. He goes to Keystone City to speak with the professor again. He’s revealed himself as the time traveler and needs the professor’s help. We learn that scars have been popping up on Nathaniel’s body. The scars look like his former Captain Atom skin. He’s been able to hide it from Takara, but he can’t hide it for long. The professor recommends they go to a nearby lab so he can look at Nathaniel. 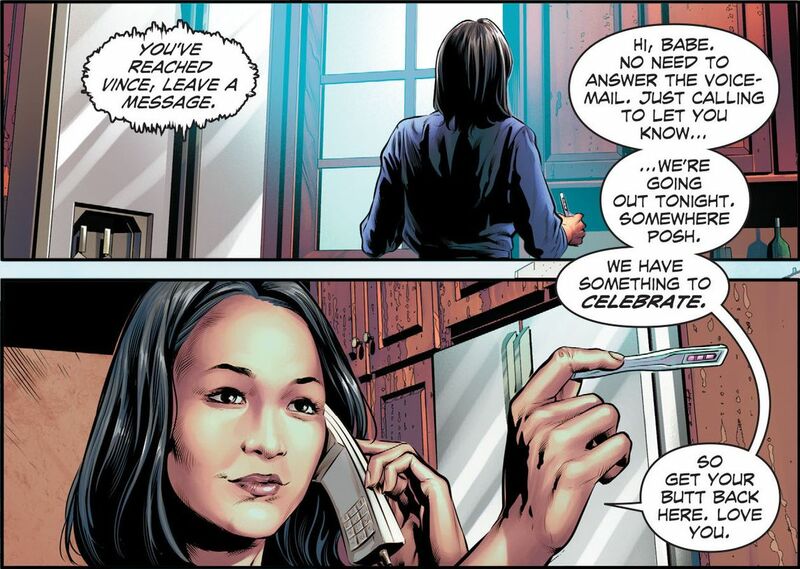 While they’re talking, Takara tries to call Nathaniel. She gets the voicemail, but we see that she’s pregnant and is waiting until he gets back to tell him the good news. In the lab, Nathaniel fries the MRI machine and the professor suggests that he’s venting on the quantum level, similar to how a human body perspires. The professor tells him to tell Takara everything. He also recommends that he takes the back roads so he can avoid traffic. As he’s driving, Nathaniel notices a girl laying down on the street. He gets out of the car to help her, but it’s a setup. Two more men come out and point a gun at Nathaniel. They waste no time and shoot him directly in the chest. Bad idea. His powers come back and the energy from his body blows up the car. He screams, “NO” as the car explodes. Instantly, he’s thrust into the time stream. We see the multiple quotes from the professor about the time stream eventually correcting itself. In each panel, Nathaniel continues to scream no, but he’s sucked further and further into the past. The last page of this issue is an unrecognizable Captain Atom, with silver and red skin, laying in a construction yard. The year is 2017. He didn’t get a chance to see his wife, learn about his baby, or live his normal life. As he lays there in the yard, he lets a last, somber, “No…” out and the issue is over. Thrust back into the past trying to commit suicide and now thrust back into the future with a new appearance. Captain Atom is going through it all in this story, and I personally love it. The writing in this one was better than the first issue. The art was solid again and the plot of this story continues to heighten. I’m intrigued at how his presence in the past affected the future. Will he get the chance to see his wife again? Does she keep her unborn baby? And how do the citizens of the future see Captain Atom? Still as the volatile hero he’s been labeled, or something more. So many questions. Second issues are always hard to pull off. The main reason this one works for me is the uniqueness of the story. Making Nathaniel an author was a smart move. I didn’t get bored with narration. The best characters in a story also help the story move forward. The professor was a different version of Dr. Megala, but he didn’t feel unnatural. I loved his relationship with Takara in this as well. The contrast of his happiness and utter sadness in this issue was masterful. I’ve never been so happy, and then sad, and then mad reading a Captain Atom comic. Another great issue. Please go pick this series up if you want to see what happens next! Don’t want to spend the money? I’ll be posting a review of issue #3 and #4 tomorrow. I hope you’re enjoying these reviews. Until next time! Peace, Love, and Comics! !